It is increasingly becoming clear that institutions are beginning to embrace crypto as an investment asset. After Morgan Stanley research findings concluded that BTC is no longer a store of value but an institutional asset class, it is only necessary for regulators to formulate laws that satiate the demand of investors. Replicating the XRP Market Report-which showed that institutional demand for XRP is on the rise, the same trait is now printing in Bitcoin. According to Grayscale Investment, out of the $81.1 million of capital inflow into available crypto assets, 73 percent of came from institutions. What’s intriguing is that funds from retirement accounts are flowing in faster than year to date expansions. This is extremely important and are pointers of what is ahead now that the SEC could make known their decision about Bitcoin ETF anytime from tomorrow. Needless to say, most are optimistic following earlier reports that the CBoE, members of VanEck and some commissioners from the SEC had a rather successful meeting where it was observed that kinks had been leveled out increasing odds of Bitcoin ETF green lights. While institutions saw safety and stability in Bitcoin sinking millions of dollars, Weiss Ratings revised preview of 111 cryptocurrencies labelled Bitcoin as “hold”. Their ratings criteria picked points from adoption, investment, risk and reward models of the coin. Like it was the case earlier this year, Bitcoin retained a C+ or Fair rating. Nevertheless, BTC is still the most valuable coin in the space enjoying the trail blazer status qualifying it as a market leader and a store of value. After weeks of being a “stable coin”, the last day event should spark some market activity. Against expectations, the BTC/USD market is relatively cool and a tad bit stable at 0.6 percent in the last week and day. However, a top down analysis of this pair points to a shifting momentum as bulls try to cement their position and snap back to trend in line with week ending Oct 21 bull bar. Despite the waning momentum, BTC/USD is actually printing higher highs. We can easily see this from price action of the last four months where BTC did reject lower lows though bears were in the driving seat. Although there was a break out on Oct 29 triggering sells, Nov 4 bulls did reverse those losses and what we now have is a three-bar bullish reversal pattern. Short-term trends depend on how today close because should it confirm Nov 4 buys then buyers can go ahead and buy on spot with first targets at $7,200. On the flip side, reversal of yesterday’s gains means the bear break out pattern of Oct 29 is well on course as the previous support trend line turns resistance. This is so because of the high market participation of Oct 15. News of USDT misdoings unsettled traders who rushed to buy BTC as a store of value. Since then volumes have been tapering, registering on average 9k against 85k of Oct 15. From an effect versus result point of view, buyers are in charge and BTC/USD is likely to edge higher. Aside from the low volume consolidation inside Oct 15 high low, prices did break below the support trend line on Oct 29. But the trend is shifting and following BTC demand on Nov 4, we now have a morning start pattern from around Oct 15 lows. This marks a 100 percent reversal of Oct 15 gains from a Fibonacci point of view and should be interpreted as positive. From institutional involvement to technical formations, all pointers are supportive of BTC. Though conservatives need to wait for clear moves above $7,200, risk-off, aggressive type of traders should buy if today close as a bull or once BTC/USD is trending above $6,500. First target remains at $7,200 and later $8,500 with fitting stops at $6,300. 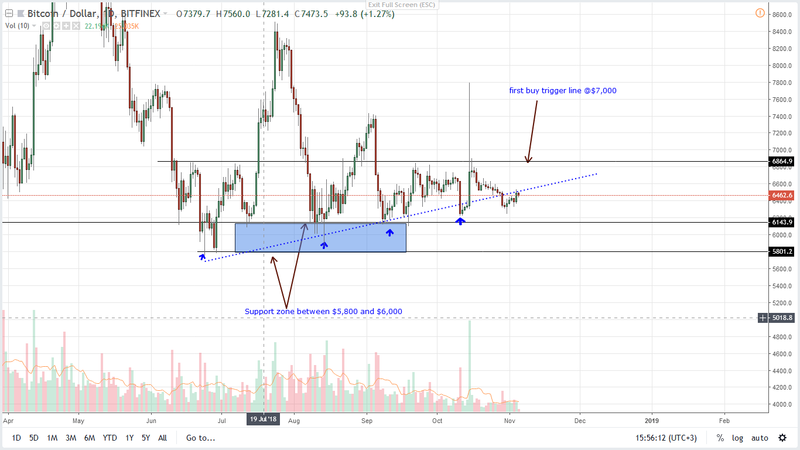 The post BTC/USD Price Analysis: Institutions Buying Bitcoin ahead of Bakkt Bitcoin Futures Launch as Price Bounce off $6,000 appeared first on Ethereum World News.